Poppy being airlifted to Safety. Poppy the horse is 'recovering well' according to her owner and is now up and walking after being rescued from the banks of the Otaki River. Massey University’s Veterinary Emergency Response Team (VERT) was called to the assist the Wellington SPCA Rescue Unit at 9am on Friday morning on the bank of the Otaki River. The two-year old filly was stranded on the bank with water levels rising and threatening to submerge the small area of shingle where it was standing. Members of the SPCA and VERT teams climbed down to the horse in order to put it in a harness, so it could be airlifted out. The horse was anaesthetised for it’s own safety. As the river level rose, the area where the horse and rescuers were standing was completely underwater. 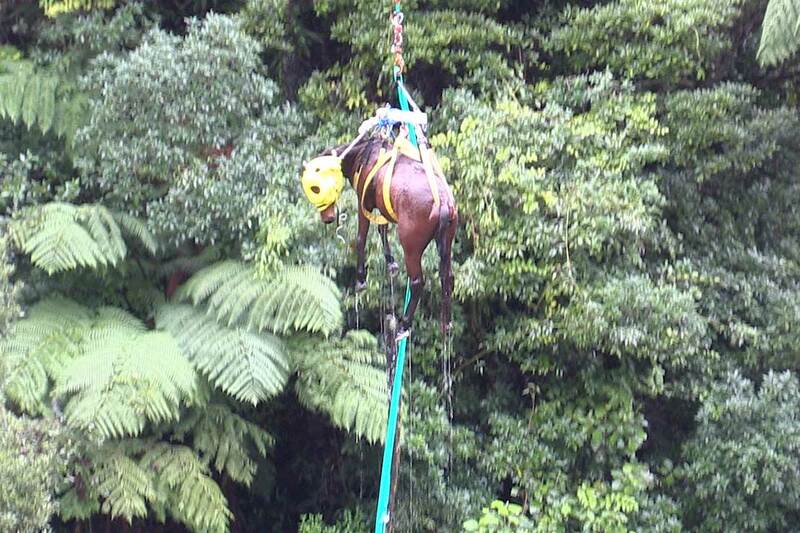 The horse’s head had to be held above the water as the team waited for the helicopter to arrive. Footage of the horse rescue. Massey University’s Veterinary Emergency Response team manager Hayley Squance says “the location of the horse was such that a rescue by any method, other than the air was dangerous both for human and animal life”. The helicopter recue took place around 1pm and the horse was taken to a nearby paddock where a veterinarian was waiting. The horse is receiving care by veterinarians and the situation is being monitored. 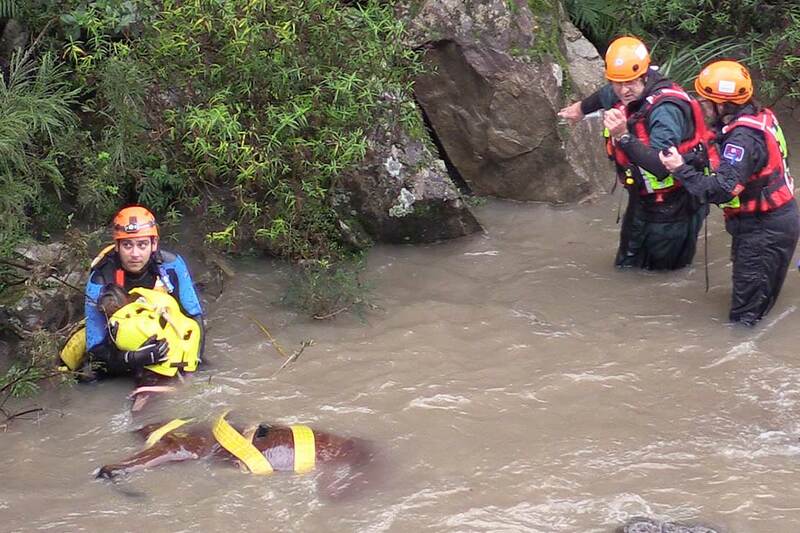 The cost of the helicopter rescue was picked up by the Wellington SPCA. VERT team member Darren Joyce holds Poppy's head above water as the water level rises. How the horse ended up on the bank is unknown, but is understood to have been walking along the banks for a few days and was discovered by rafters on the river who then reported it to the Kapiti District Council. The owner was alerted and climbed down the banks to settle the horse while help arrived. Agencies involved in the rescue include: Palmerston North City Council Rescue Emergency Support Team, Kapiti Coast District Council Animal Management, NZ Police and Wellington Helicopters. The Massey team relies on donations, grants and sponsorship to enable its full and ongoing function. To donate click here. 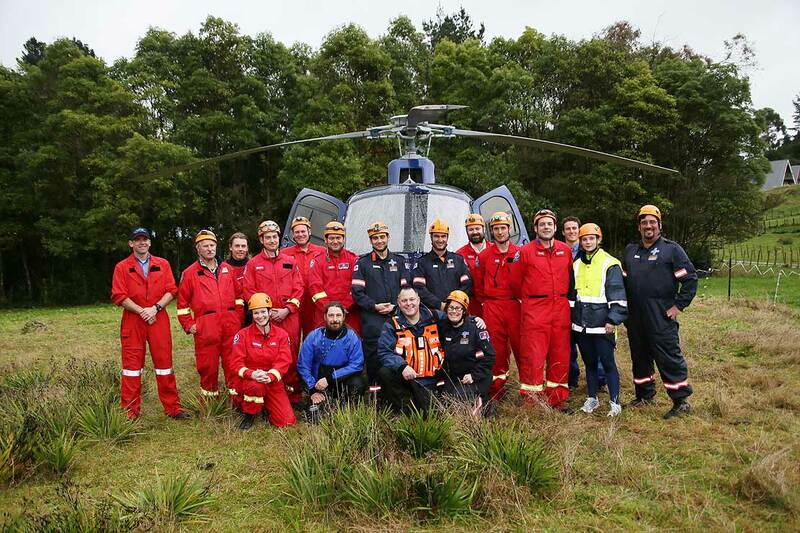 Members of Massey University’s Veterinary Emergency Response Team, Palmerston North City Council Rescue Emergency Support Team, SPCA Animal Rescue Unit and Wellington Helicopters.